I recently had the chance to interview Horror Section. Check out the full interview below. For those unfamiliar with your band can you tell me a little about how you got into music and where some of the inspiration came from for starting a band like Horror Section? I got into music mostly through my older brother. He definitely got me excited about music and we would listen to tapes we recorded off the radio endlessly. I’m one of those people that got into pop punk through Green Day. As soon as I discovered bands like the Riverdales and Mr. T Experience I was ruined, haha. I’ve never loved bands more than that classic Lookout era sound. As far as starting Horror Section, I’ve been into concept or theme bands for a while. 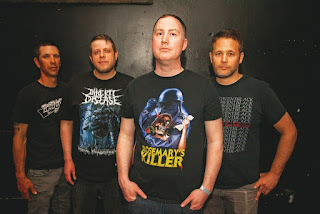 Bands like Send More Paramedics and Near Dark inspired me for sure but even before them I wanted to start a Nightmare on Elm Street themed pop punk band. That never materialized, fast forward 10+ years and here we are. Your debut album came out in October of last year. It was my favorite album of the year. What was the recording process like for the album and how long did you work on it? Thanks, that means a lot! The album took a long time to come together. Some of the songs were 5 years old! We are definitely not a conventional band when it comes to the recording process. I’ll make terrible demos, send to Tommy, and he’ll make them sound awesome. This time around Tommy wrote the music for about half the songs which I then came up with lyrics and vocals for. We don’t live that close so we end up exchanging files online and Gabe our drummer combines it all and records and engineers the whole thing. We’re lucky in that respect. What is your songwriting process like? Do you start working on the music before you choose a horror movie you want to write about or do you pick the movie and then write the song? For previous releases the movies were already picked out first. For this release I made a list of early 80’s movies and then chipped away at them. I usually have a handful of melodies or song parts recorded on my phone that I dip into when I get inspired by a film or idea. A favorite song of mine from the debut album is "Resonator". Can you tell me a little about how that song came together? Ah, that was a song Tommy wrote. When he sent me the music I instantly like it but was stumped on what the hell to sing over it. I think it went through 5 iterations of me trying different melodies and timing and put it to the side for a few months. When I came back to it with From Beyond as a reference it all just fell into place. Glad you dig that one, it’s a little different. You guys have a fan base that really supports your physical media especially vinyl releases and limited shirts. It sells out and has a pretty high demand among fans. Did you ever expect that kind of fan base or support and how does it impact how you release your music and merch? I never expected people to care, no. I put out our first 7” myself and only had 150 made since I was convinced no one would care about a horror pop punk band. It was only after Travis from Eccentric Pop talked us into re-releasing it that I thought a label was even a possibility. As far as how we release I know some people get excited for limited things and some people get irritated. I decided not to do that for the LP as things like the burlap sack, magnet, trading cards, Prowler letter, inverted cross foldout, etc. all take time and money. I wish we could mass produce tons of stuff but it’s just not feasible for a band at our size. In the end though, if I have an idea I try and do whatever it takes to make it happen. Travis is a good sport about helping me realize my vision too. Much like horror collectibles, I just like to have something unique with our records. A common question I see from your fans is about 'The Prowler' and if it will get a new vinyl pressing. Do you see that happening anytime soon? I’m not sure about that one. We did 3 (small) presses of it and I’m not sure it makes sense to press again to be honest. I’ll think about it though, ha. You write songs about horror movies. Have you ever considered a concept album around creating your own original horror story told through songs? I have not. I really don’t see any radical directional shift for the band in the future (for better or worse). That being said, there are a few other music projects I’ve been meaning to start up for several years and just haven’t had the time or patience yet. I’ll let you know if those ever happen haha. 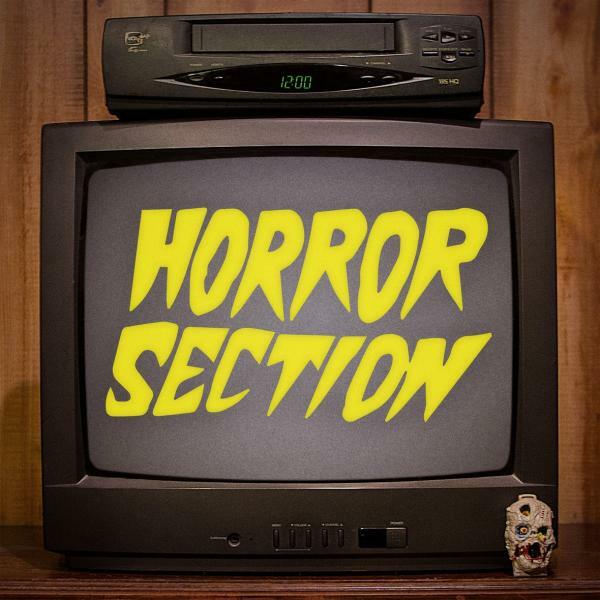 Teflon Dave also has a podcast, that I really like, about horror movies. Can you tell me a little about how the podcast got started and what you have planned with it for 2019? Hey that’s me! And thanks! Ghost Party Podcast was started after my old roommate Matt moved out and we missed watching horror movies and talking about them. We pretty much used the podcast forum as an excuse to hang out, drink beers, catch up, and talk horror. Devin joined us a few episodes in and we always have a blast. We’re not the most “professional” or “educational” podcast out there but I’ve been told that listening to it is like hanging out with some friends. As for 2019, hopefully we get a little more organized - life has been hectic and we’ve been a little lax on the itinerary. That’s ok though, I’m counting on Matt to make that happen, haha. But also I want to do more road trips with my spooky buds and do some episodes in a cramped hotel room. Do you have a favorite episode of the podcast you could recommend? I’d say episode 23 (Blood Rage) or episode 21 (Death Spa). Thanks for the questions and thanks for checking us out!